December 6, 2001, I had a stroke. I was coherent but could not stand; my balance was completely gone. My family called an ambulance for me, and I was admitted to our regional hospital. While in the ambulance I blacked out. My wife tells me that I could still talk, though somewhat strangely. At the hospital I woke up, but then became violently ill. Then I passed out again and don’t remember much until the 27th of December. In emergency, I was examined by five doctors who were interns — four men and one woman. They felt that I was obviously very ill but would make a good recovery. The next day was a Friday, the woman doctor’s day off. My condition worsened, and the remaining four doctors concluded that because I was diabetic, things were worse than they had first thought. By Friday evening they felt that my death was imminent and called my family to encourage them to start making funeral arrangements. Friday night a nurse who sat beside my bed most of the night giving me injections kept me alive. The woman doctor returned the following day, Saturday, and was confronted by my wife, who wanted to know what had changed since the initial assessment. This doctor knew that two neurosurgeons were visiting from a major Brisbane hospital, so she searched them out and asked them to come see me. They did, and felt that something might still be done for me. They said they would do their best — but gave no promises that I would survive. They transferred me to another hospital, but I suffered a heart attack in the ambulance. That required five days in intensive care, and a hole drilled into my skull to relieve the pressure of fluid that was pushing my brain down into my spinal column. I spent two months in hospital, one in the wards and one in rehabilitation. I left at the end of January and returned home. Today, I have no obvious impediments and walk normally. Doctors call my recovery miraculous. 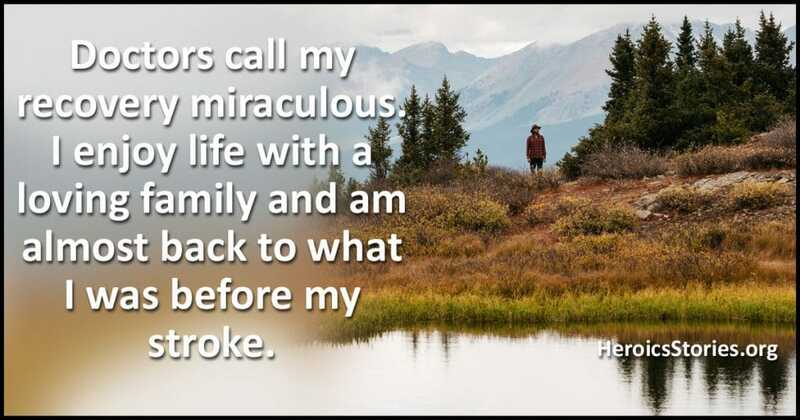 I enjoy life with a loving family and am almost back to what I was before my stroke. The woman doctor could have followed the lead of the other four doctors who concluded I was gone, and walked away from me. Instead she referred me to the neurosurgeons. Two years later I owe my life to her — because she never gave up. When you want to live, sometimes it just takes a person who can hear you, and is willing to give you the best chance s/he knows of, no matter what kind of health system the country has.